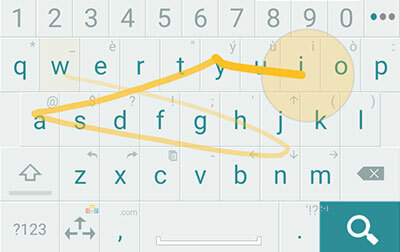 Android Keyboards such as Swype allows us to simply slide our finger across the individual keys one by one and this gesture picks the word that we have in mind. You will be surprised by the accuracy of this swipe to type feature. It makes typing in a small on-screen keyboard much more accurate and fun. 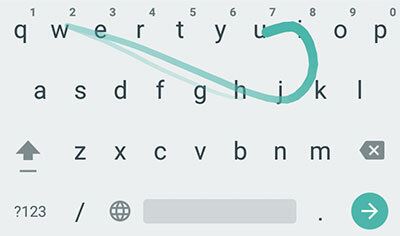 Your typing speed also improves drastically as you get accustomed to type using the finger sliding method. Keyboards in smartphones have evolved to help people type quickly. There are features such as auto correct, word suggestions and gesture typing which allows us to be as quick as possible. When compared to physical keyboards, on-screen soft keyboards have the possibility of being flexible. That means keyboards can be resized, dictionaries can be updated and fingers can be slide across the keys to generate the exact word. Google keyboard happens to be a free keyboard app by Google, the developers of Android. This keyboard comes pre-installed in Nexus phones and tablets. You won't need to switch to another keyboard if you already have this on. Words that you input via it are easily entered with the help of swipe gestures. Just drag your index finger from one character to another to form a word. 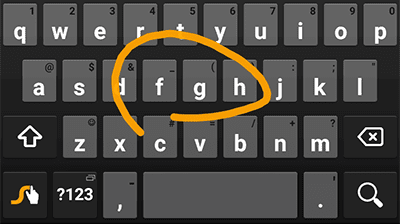 If you want to type continuously, slide your finger over the space bar key and start sliding for the next word. The space-aware gesture typing feature will identify the end of a word and allow you to begin the next word. It is really impressive how this keyboard knows what you want to type. The error rate is really low. This is also a free keyboard application for your Android phone. After installation, you have to set up the keyboard. You have to select a language pack and download it at first to begin using it. There are tons of other supported languages like French and Hindi. The whole list of languages it supports is long. You can also connect this app to the cloud, hence allowing it to learn your words, sync and access them across multiple devices. There's even a feature to allow it to access your Gmail messages so it can learn new words to increase the ease of typing. There's also a feature that allows you to change the appearance of the keyboard with the help of themes. This is the free version of the popular Swype Keyboard by Nuance Communication. The trial version allows you to choose languages and use the "swiping finger over keys" method to type. This version is limited to 30 days but till the trial period is over you can enjoy this great app. The upgrade costs $0.99 only but there are other free keyboards mentioned above which will give you similar features. For tablets, the design is flexible and switchable between a full screen layout, a small layout and a movable layout. The voice dictation feature supported by this app is also commendable. Like Swype, this one is also a trial version of ai.type Keyboard with the same swipe to type feature. The trial version is usable for 14 days after which you will have to upgrade to a paid version that costs $4.13. The cost is higher than the other paid keyboard discussed in this post. The main difference between these four keyboards is how they guess words. Some are pretty good at guessing words while others are not so great. This one has a fairly good word prediction feature and additional features include supporting tons of other languages, themes and designs, and voice narration. Overall, these four keyboards are all that you need to take a look at before deciding on a swipe to type keyboard. Gesture typing is fun and easy, and it is recommended to choose the free ones first. Try the trial version and upgrade to the premium or plus version if you feel that the cost justifies the benefits. 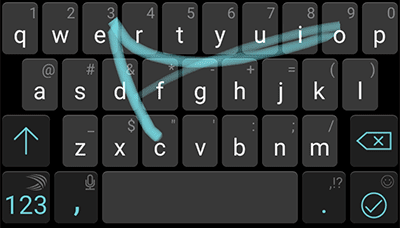 Remember that the same features can be extracted from the always free ones mentioned above: SwiftKey and Google Keyboard.